There is a trade opportunity based on potential M.E.T. 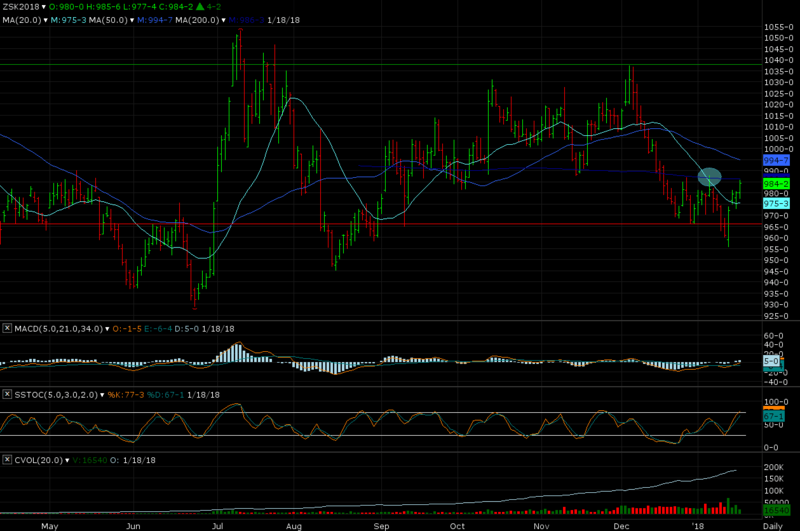 breakout in the Soybean futures market. The Stochastic indicator is showing strong Momentum to the upside. The Trend Seeker is currently down, though with a weak ranking. The MACD indicator has shifted bullish already. Buy: May 2018 Soybean futures contract on 988’0 using a stop order, GTC. Entry is a break of 1/05/18 session high. You may trade the mini Soybean futures contract with an Initial Margin of $286 and Maintenance Margin of $260. The risk would be $230 and the profit would be $470 based on the same prices above. This is a sample entry from Don DeBartolo’s email newsletter, Trade Spotlight: Futures, published on Thursday, January 18, 2018.